Making a persuasive case for avoiding meat, the Goldbecks argue that vegetarianism addresses concerns about air and water pollution, food-borne pathogens, humane treatment of livestock and one's own general health, at the same time offering "much ... sheer enjoyment." To bolster this argument, they provide recipes like Quick Vegetable Bean Soup, built on a pleasing tomato-flavored broth, as well as the more appealing Hearty Miso Vegetable Soup, jazzed with carrots, potatoes and corn. A Tomato Gratin with olives and capers tastes almost Mediterranean, while Baked Stuffed Onions make a tasty main course, especially when filled with cracked wheat that's been steamed in mint tea. French-Style Lentils with Vegetables are a convincing imitation of the Parisian bistro classic-minus, of course, the typical bacon garnish. Desserts are of the virtuous school, which means less cane sugar and more maple syrup; nevertheless, Applesauce Date Cake is a moist treat, and Chewy Oat Cookies are fit for even the most finicky child's lunchbox. What this vegetarian cookbook lacks in originality it makes up for in healthy meal ideas and excellent intentions, though, curiously, none of these recipes include nutritional information, a frustrating omission. "A comprehensive and delectable tour of tasty meals...[Enemy of the Steak] is an excellent guide for alternatives to getting dinner on the table in fresh and inventive ways. Those seeking a low-fat diet, or with allergies to dairy or wheat, will also find much to munch. so drop that pork chop and take a peek." Nikki and David Goldbeck have been writing about consumer issues, health, and nutrition since 1972. They are the bestselling authors of six books, including American Wholefoods Cuisine and Healthy Highways. Nikki Goldbeck is a practicing nutritionist and food educator who holds workshops for people with heart disease, diabetes, cancer, and obesity. The Goldbecks currently live in upstate New York. It's funny that we vegetarians find ourselves in this position--enemies of the steak. We are not really looking for a fight. As it happens, our aim is simply to show the pleasures of plant-based eating because we have learned that meatless cuisine has much to offer in terms of both health and sheer enjoyment. That's what Enemy of the Steak is all about--making vegetarian dishes that are tempting and nourishing, and that fit easily into today's busy lifestyles. Never before has it been so easy to create food that is both good-tasting and good for you. Over the past few decades, North America has become one of the world's great culinary incubators. Our markets are filled with an abundance of fresh and varied foods. Moreover, a new health-oriented approach to cooking has emerged that has gained respect from both nutrition experts and gourmet food enthusiasts. The two of us have personally spent more than thirty years working in the areas of cooking, nutrition, and health. During that time, we have enjoyed making a contribution by developing a more accessible, attractive, and healthful vegetarian cuisine. Now, in Enemy of the Steak, we apply both our creativity and our kitchen expertise to preparing this bounty of food in more than two hundred convenient, interesting, and satisfying ways. As you are about to discover, Enemy of the Steak is not like other vegetarian cookbooks. It is not filled with the stock vegetarian dishes already found in so many books. This is because Enemy of the Steak is more than a collection of tasty, meatless recipes. It takes healthy dining to new heights by formulating dishes that are a marriage between the science of nutrition and the art of cooking. How have we made our dishes not only delicious but also healthful? First, our recipes rely on wholefoods--that is, unprocessed ingredients. This is not necessarily the case with other vegetarian cookbooks, but has always been our practice. Second, our recipes are based on a set of nutritional principles that have evolved over three decades of study and nutrition practice. (To learn more, see "About the Recipes" on page 2.) The result is a truly enjoyable collection of dishes that assure the variety and balance a healthy diet requires. Why don't our recipes contain meat? The answers can be found in the inset on page 4. Despite the many reasons to be a vegetarian, you don't have to ban meat from your table. But for everyone who is a vegetarian, for people interested in exploring meatless dining, and for those who simply want more good food on their daily menu, we know that Enemy of the Steak offers nutritionally sound and great-tasting options. Although this is not a "diet" book or nutrition manual, the recipes were spurred by Nikki's work as a nutritionist and her decades of research into healthy diets. Her experience working with people who are at risk or have already faced a variety of conditions and illnesses--including weight problems, heart disease, diabetes, cancer, and eating disorders--has given her a rare perspective on the health-diet-cooking-life-style relationship. She has met with many people eager to embrace a healthy diet, and has learned what they are looking for and what concerns they have in common. Likewise, she has grown in her work as clients revealed the secrets of their successes, as well as the pitfalls, frustrations, and confusion they've encountered along the way. Since, in addition to providing nourishment, food plays a strong cultural and social role in most people's lives, these experiences have all helped us develop recipes that fit comfortably into modern life. To achieve optimal nutrition, we believe that people must relax and fully enjoy what they eat. We can think of no better way to do this than to sit down to a meal knowing that the food is of the highest caliber, the recipes were professionally tested, and the results have won widespread praise from those who have shared them. The philosophy behind these dishes is one that has guided us in all our previous cookbooks, and is tied to the way our bodies are designed. You see, the human digestive system is essentially the same one our ancestors had 50,000 years ago. It best digests and utilizes the foods provided by our habitat. For the most part, these basic foodstuffs were discovered by our Stone Age ancestors in a hit-or-miss fashion. Those who ate best tended to live longest, and consequently their heirs and friends followed their example. The accepted diet became the one that maintained the species, and thus you might say it is a Darwinian diet. Additionally, as certain foods have become more constant in the diet, our bodies have accommodated these choices. Processed and fragmented foods, as well as those that include unnatural amounts of sugar, salt, and fat, or any amount of modern food chemicals, are still very new to our system. We have seen many problems created by the fragmentation of wholefoods. The challenge has always been to find the best way to enjoy vegetarian wholefoods dining in a modern context. That is the essence of Enemy of the Steak. As mentioned earlier, the recipes found in Enemy of the Steak will help you create dishes that are far more than just enticing and easy to prepare. They represent a new level of cooking that evolved from decades of study and nutrition practice. As such, when creating the dishes found in this book, we followed these simple but important guidelines. The recipes are based on wholefoods--that is, foods that are processed as little as possible and contain no chemical additives. In keeping with this, no refined ingredients are used. This means that the recipes include only whole grains, whole-grain products, and unrefined sweeteners. All ingredients are free of hydrogenated (trans) fats. 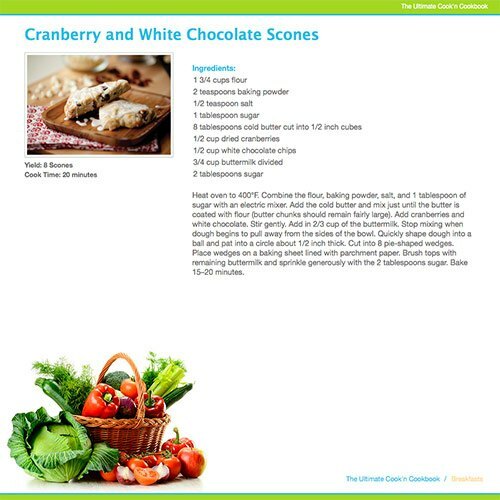 The recipes balance carbohydrates and protein to improve health and assist in weight management. Either few or no fats are used. Instead, recipes are designed to take advantage of the fats found within foods. This technique accomplishes three things. First, it lowers the overall amount of fat. Second, it helps create a more favorable balance of fats in the diet. Third, it decreases the use of concentrated fats in the form of oils, which are not really wholefoods and thus are missing some of their native constituents. The use of vegetables and fruits is maximized. This strategy--which naturally increases the amount of vitamins, minerals, fiber, and other important nutrients found in each dish--is agreed on by all health authorities. Soy foods, legumes, and yogurt are used often to encourage consumption of these valuable foods. Dishes and suggested menus incorporate a broad variety of ingredients to support a healthful intake of all nutrients. To follow the guidelines presented above, we occasionally revamped traditional dishes to make them healthier without sacrificing enjoyment. You will see this in our Black Bean Hummus, Superior Spinach Dip, Mashed Potatoes with Garlic, Creamy Italian Dressing, Chickpea Pesto, and Gold Chip Cookies, among others. You will also notice that Enemy of the Steak employs a few cooking techniques that are not widely found in other cookbooks, including stir-steaming and the stewing of foods in their own juices. 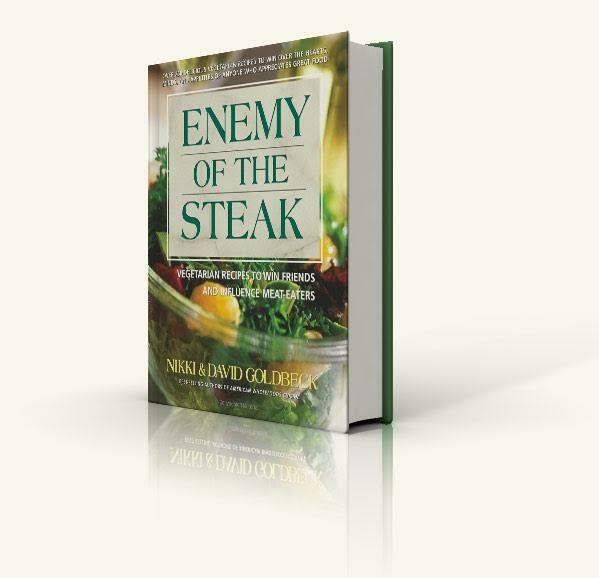 Enemy of the Steak provides a solid core of recipes that will allow you to substantially improve your diet and feel comfortable in the kitchen. Before you turn to the first recipe chapter, though, you should take a look at Chapters 2 and 3. Chapter 2, "Stocking the Pantry," will guide you in filling your kitchen with the foods you'll want to have on hand so that you can easily put together the dishes presented in this book. Chapter 3, "Basic Training," offers some key recipes, flavoring tips, and comprehensive guidelines for preparing the beans, grains, and vegetables that hold a prominent place in the vegetarian repertoire. The hardest part of planning healthy vegetarian meals is knowing where to start. Enemy of the Steak will take you beyond pasta and pizza. Remember, you do not have to be a full-time vegetarian to enjoy and benefit from meatless meals.